Gov. Ige, Nanakuli senior class president Tala Ealim, DOE superintendent Dr. Christina Kishimoto and assistant superintendent Dann Carlson with solar-powered AC. 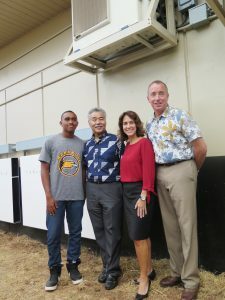 • Cooled 1,300 of Hawai‘i’s hottest classrooms – Governor Ige exceeded his promise to cool more than 1,000 classrooms with a $100 million legislative appropriation. Students and teachers at over 88 schools on five islands benefitted, with more improvements to come. • Completed a new Blueprint for Public Education – More than 3,000 school and community members statewide provided input for the Governor’s Every Student Succeeds Act team to improve schools statewide. New Department of Education superintendent, Dr. Christina Kishimoto, will focus on closing achievement gaps and building innovation in school design. • Established innovative programs from K-12 through higher education -The governor worked successfully with the Legislature to secure funding for initiatives such as Early College and Hawai‘i’s Promise to ensure more local students follow a path to 21st century careers and realize their talents. 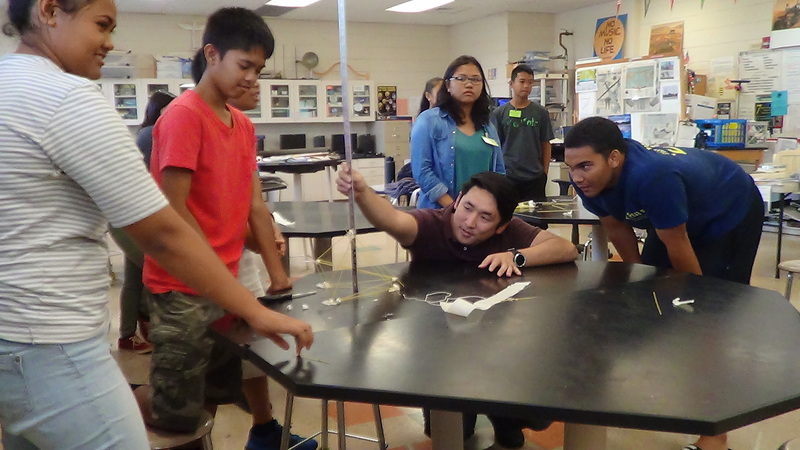 EARLY COLLEGE: Dr. John Hirano (center) a Ph.D. in engineering, works with incoming Waipahu High freshmen in the first Early College STEM summer camp. Governor Ige was recognized recently for bringing the CyberStart pilot program to Hawai‘i students for job training and improved cybersecurity statewide. “Hawai‘i’s scores were remarkable,” said Alan Paller of the SANS Institute, which sponsored the program. Of the 3,300 students competing from seven states, eight Hawai‘i high school and college students were in the top 50 nationally.